Make your coffee mornings even more stimulating with our new collection of Ebele mugs. Beautifully hand crafted and painted in natural tones, they are available in cashmere, coal and linen. Your cup will always be half full with these in hand. 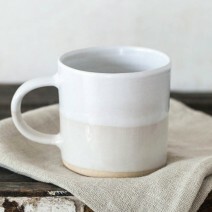 Our cashmere Ebele mug is a beautiful, artisanal neutral piece that will look great in any home.